This wonderful bracelet is made of 8-9 oz. vegetable tanned leather and is hand dyed in either solid black or solid brown. 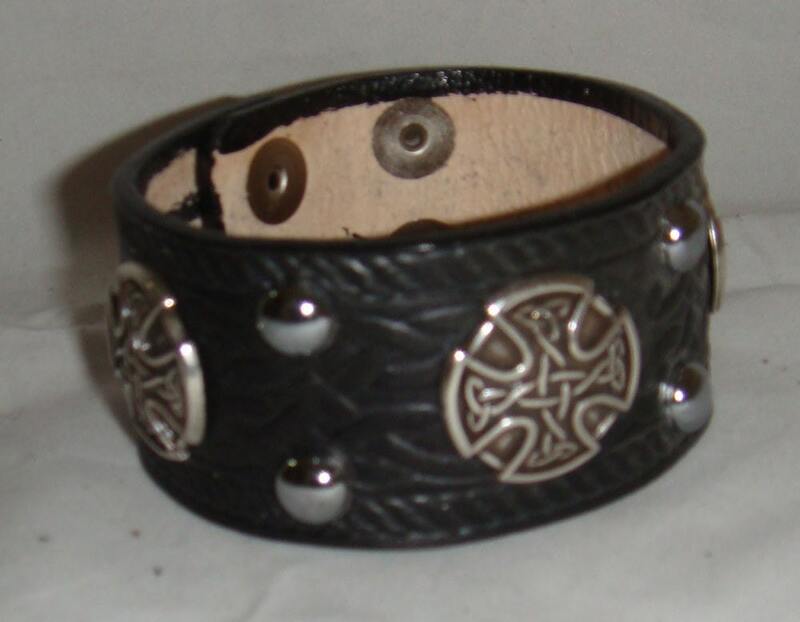 The strap is embossed wiht a rope edging and a celtic knotwork center. Three celtic conchos adorn this fine piece and is edged with chrome plated brass studs. A double snap is the closure and is set to fit approximately a 8"-9" wrist, so unless you have tiny or rather large wrists it should fit just fine. The bracelet is 1-1/2" wide. Please specify color in a note at checkout. We generally ship via US Priority Mail. Feel free to check out a wide variety of other hand crafted leather items for sale on our web site at www.GriffinWorksLeather.com.